Sketch of the CSS Virginia. The Battle of Hampton Roads, fought on March 9, 1862, marks the first time two ironclads engaged in battle: the USS Monitor and the CSS Virginia (formerly the USS Merrimack). While both warships escaped destruction that day, neither would survive the year intact. 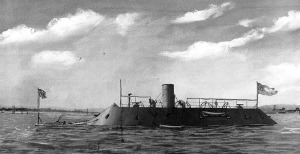 The CSS Virginia was destroyed by the Confederacy in May rather than risk its capture by Union forces. On December 31st, the USS Monitor sank off the coast of Cape Hatteras, North Carolina during a heavy storm. Duke University has ties to both. In 1973, John G. Newton, Marine Superintendent for the Duke University Marine Laboratory, led a team that discovered the wreckage of the Monitor. Artifacts recovered from the site are currently on display at the Mariners’ Museum in Newport News, Virginia. However, the Duke University Archives might have a piece of the Virginia/Merrimack in its possession. Earlier this year, the University Archives curated “‘As Far As Possible from Forgetfulness’: The Trinity College Historical Society.” Precursor to the University Archives, the Society was established in 1892, with the objective of collecting material illustrative of the history of North Carolina and the South. The exhibit included artifacts and documents that once belonged to the Society. One of the most popular pieces displayed was a non-descript piece of wood. My co-curators and I found no mention of this item’s identity or significance in the Society’s records, yet we felt strongly that the piece of wood should be included in the exhibit: at some point in the history of the Society, someone believed that piece of wood had historical significance. On the day of the gallery talk on the exhibit, I delved deeper into resources available in the University Archives in hopes of uncovering any tidbits on the piece of wood. In the Christian Educator (a predecessor, in some respects, to the Chronicle), I found a reference to two pieces of wood donated to the Society in 1896. One was said to be from Libby Prison in Richmond and the other was said to be from the CSS Virginia/USS Merrimack. I mentioned these references at the gallery talk and also stated that a RBMSCL colleague with a background in archaeology noted the piece of wood appeared to have been in water at some point, leading me to speculate that this particular piece of wood might be from the ironclad. Professor Emeritus of Botany and former director of the Sarah P. Duke Gardens Richard White attended the gallery talk and graciously offered to submit a sample of the piece of wood to a lab in Wisconsin that could potentially identify its species. We were able to obtain a loose sample from the artifact which was then submitted to the Center for Wood Anatomy Research for testing. The lab determined the wood to be of the white oak group. Further research shows that white oak was often used in the construction of Civil War ironclads, including the Virginia/Merrimack. 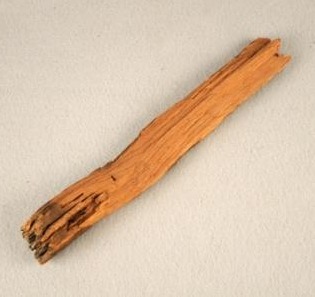 Is it possible that the mystery of the piece of wood’s identity and significance has been solved? Post contributed by Kim Sims, Technical Services Archivist for the Duke University Archives. Mad Men Monday -- Season 7, Episode 3 "Field Trip"